Roaring Currents has turned the Korean opening weekend record to rubble with 3.34 million admissions ($25.65 million) during its first weekend, which accounted for 65.7% of the marketplace. That represents a 41% increase over the former record, set by Transformers 3 in 2011 (2.37 million). The film has already banked 4.75 million viewers and $35.4 million since its debut five days ago. The film stars Choi Min-sik as Admiral Yi Sun-shin, who led a small fleet of 13 ships to victory against Japan and its 333 vessels in the Battle of Myeongnyang, which took place in the 16th century. 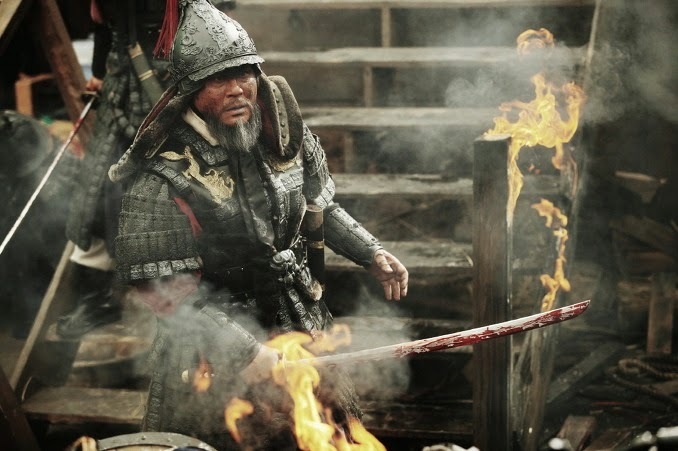 Co-starring as the Japanese admiral is Ryu Seung-ryong and War of the Arrows (2011) director Kim Han-min is at the helm. Roaring Currents has rewritten almost every record in the book since Wednesday, when it bowed to the biggest opening day of all time (682,802 viewers). It then scored the biggest non-holiday Thursday (704,956 spectators) and the biggest every Friday, Saturday and Sunday (866,371, 1.23 million and 1.24 million tickets sold, respectively). On Saturday it became the first film to crack one million admissions in a single day and its Sunday total now stands as the largest single day take at the Korean box office. In addition to the largest 1 day total, the film set new benchmarks for biggest 3, 4 and 5-day admissions totals (2.28 million, 3.51 million and 4.75 million respectively), as well as new records for fastest to 2, 3 and 4 million spectators (3, 4 and 5 days, respectively). The last weekend of July is traditionally the biggest theatergoing frame on the calendar and is typically dominated by local fare, as studios capitalize on the holidays and the extreme heat which drives the public to cool multiplexes. Former films that have launched on this weekend include The Host (2006), Haeundae (2009), The Thieves (2012) and Snowpiercer. Driven by Roaring Currents, this past weekend soared to 5.07 million admissions, also a new record. As a big-budget visual spectacle based one of the most famous events in Korean history, Roaring Currents was poised to generate strong returns but no one expected such an impressive debut. In the wake of the Sewol Ferry Disaster, it looks like viewers were eager to take in something they could feel proud of, in the form of Admiral Yi Sun-shin's legendary exploits. Meanwhile, last week's big debut, Kundo: Age of the Rampant (which bowed with 2.12 million viewers) took a steep 76% drop as it wound up in third place with 514,363 admissions. The period action film with Ha Jung-woo and Gang Dong-won has attracted a strong 4.47 million admissions ($43.1 million) in 12 days. Staying at number two with 574,703 viewers after a 22% slide was How to Train Your Dragon 2 and Guardians of the Galaxy debuted at number four with 457,575 admissions. Next weekend will welcome the debut of The Pirates, the third period blockbuster in as many weeks. Though with Roaring Currents looking so strong, there may not be much room for it at the top of the charts.